I am very happy to be working once again with Joe Campana, owner of a number of fine dining establishments in the heart of Colorado Springs. 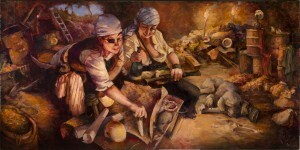 His newest venture has called for a series of pirate paintings, which has been an extremely entertaining commission! The chance to work just as the old illustrators did, setting up models in costume and settings, has been so much fun! Stay tuned — I plan to continue this series for a while! The recent work has even been featured in the Rocky Mountain Food Report!